Buy Half Dozen Original Glazed Krispy Kreme Doughnuts for only P77! 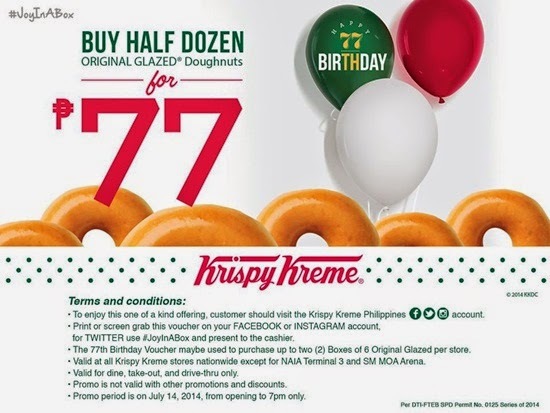 In time for their 77th Birthday, Krispy Kreme is giving their loyal customers a treat with their Birthday offering! On Monday, 14 July buy half a dozen Original Glazed doughnuts for only Php77, valid from store opening up to 7pm! Simply visit your favorite Krispy Kreme branch and present a printed or screen-grabbed copy of this voucher on your Facebook or Instagram account. For Twitter, use the hashtag #JoyInABox and present to the cashier. This voucher entitles a client two (2) boxes fan at all stores nationwide except at the stores in NAIA Terminal 3 and SM MOA Arena and the kiosks found in SM Marilao, SM Taytay, SM Marikina, BF Resorts, The Block, Harbour Point, Sta Lucia, Robinson’s Place Forum, SM Sucat, SM Annex Fairvew and BHS Cinema. This entry was posted in announcement, free grub and tagged doughnuts, Krispy Kreme on 11.July.2014 by admin. As an early Christmas treat, our sweet friends from Krispy Kreme presents this delicious offer! Get the next dozen for only Php76, when you buy a dozen Original Glazed Doughnuts! 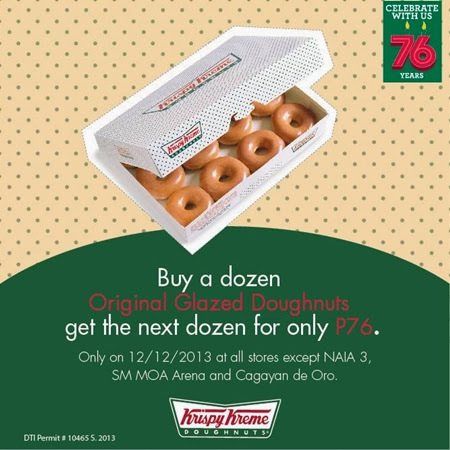 This promo is valid on 12 December, 2013 at all Krispy Kreme outlets, except the NAIA 3, SM MOA Arena and CDO branches. This entry was posted in free grub and tagged doughnuts, Krispy Kreme on 4.December.2013 by admin.